Why worry about urban biodiversity? Why not just concentrate on biodiversity conservation outside the boundaries of cities? First, the millions of people who make daily decisions in urban environments can have huge impacts on local and regional natural resources. We have crossed a threshold around the world: more than 50 percent of the world's population resides in urban areas. Over the past century, we have learned that local decisions have global consequences and global decisions have local impacts. Building communities takes a vast amount of natural resources; think about the energy required to make and transport building materials to create homes, roads, and landscapes within a given community. Then think about how we live in these communities: we heat and cool our homes, drive from one place to another, consume food, and maintain our yards. All of this takes energy, in the form of electricity and liquid fuel. Energy has to come from somewhere, and today, most of our energy is derived from fossil fuel sources (coal, natural gas, oil). Mining for coal, and drilling for oil and natural gas, affects our land, air, and water. The construction and maintenance of cities is contingent on the consumption of natural resources gathered from local, regional, and global locations. Calculating the ecological footprint is a popular scientific technique that determines the amount of land and marine area required both to supply the resources a human population consumes and to absorb and dispose of the corresponding waste this consumption generates. In the United States, the biocapacity, or the amount of land available to support the population, is less than the amount of land needed to satisfy current consumption rates (Table 1). So the country is operating at a deficit and will need to find additional land outside its borders to gather the required resources to meet current consumption levels. How is biodiversity conservation linked to natural resource consumption? Often, the incorporation of biodiversity principles into growth management strategies has the added benefit of reducing natural resource consumption. For instance, the use of native plants and ecologically minded construction techniques to conserve topsoil and existing trees can reduce water and energy consumption and decrease the impacts of residential growth on nearby environments. In landscaping, topsoil conservation and the use of native plants instead of nonnative turf often lead to a reduced need for irrigation, fertilizers, and pesticides. In combination with a reduction of impervious surfaces such as asphalt, and the use of more trees to intercept rainfall, such efforts lead to reduced stormwater runoff and fewer pollutants being carried to nearby wetlands. In neighborhoods, conserved trees help shade homes during the summer, reducing energy needed to cool a home. Conserving urban biodiversity will pay strong dividends to the reduction of natural resource consumption simply because the world's urban population is only going to increase. In addition, when people have their first or primary experience with nature in their own yards and neighborhoods, an opportunity exists for them to feel a connection with the land, and this can generate a multitude of environmental stewards. Urban neighborhoods and workplaces are where people recreate, interact with friends, spend money, consume resources, and generally spend the majority of their time. Unfortunately, biodiversity in urban areas tends to be minimal, and the species that we see in urban areas are often nonnative and can be seen from one city to the next. Because of this homogenization, urban denizens encounter few of their local plants and animals and become disconnected from their natural heritage. Daily contact with a limited diversity of native species and habitats promotes a sense that biodiversity is not that important to people living in cities. If decision makers, such as elected officials, urban policy makers, and developers, see the current state of urban environments and presume it is as it should be, they will continue to implement design and management strategies that do not incorporate biodiversity principles. Case in point: open space conservation continues to be undervalued and plays second fiddle to other socioeconomic concerns. The experience in a homogenized urban environment can lead to environmental amnesia from one generation to the next. Children who grow up in cities with little biodiversity become accustomed to these environments and, as a result, place little importance on the decline of natural environments that surround their neighborhoods. Ultimately, urban opportunities to experience and understand local natural heritage will promote a conservation ethic. The ecological integrity of natural areas is directly and indirectly affected by nearby cities. Urban growth fragments the natural environment, and such fragmentation can lead to the disappearance of sensitive animal and plant species. For example, the gopher tortoise (Gopherus polyphemus) is a species of special concern in many states, because its population has declined over the years as urban and agricultural development has destroyed its habitat. Even the design and management of urban landscapes can have significant impacts on surrounding lands that house certain species like the gopher tortoise. With landscaped yards, there is a risk that nonnative plants may spread and become established in surrounding natural habitats. Called invasive exotics, these nonnative plants have frequently originated in urban areas-for example, several invasive exotic plant species have spread from their original locations in urban areas in California. The maintenance of lawns and exotic horticultural plantings often requires the use of an array of pesticides, fertilizers, and herbicides. Fertilizers affect rivers, streams, and lakes by raising the levels of nitrates and phosphates, ultimately contributing to algal blooms, fish kills, coastal dead zones, and the spread of invasive exotic plants. Recognizing that cities are primary areas through which people interact with and have an effect on nature, a group of scientists from around the world produced a unique document called the Erfurt Declaration (Box 1). This declaration is a good summary of the significance of urban biodiversity conservation. With well-designed and well-managed urban areas, biodiversity within a city's boundaries can be increased and detrimental impacts on surrounding land can be decreased. Such results promote the conservation of healthy, natural environments across a region, and this benefits not only society, public health, and the economy but also entire ecosystems. Civilization is not, as they often assume, the enslavement of a stable and constant earth. It is a state of mutual and interdependent cooperation between human animals, other animals, plants, and soils. Urban, rural, and natural areas all interact in dynamic ways, and as stated earlier, what happens within urban areas affects the environment on local, regional, and global scales. Adopting practices that conserve the diversity of urban organisms can pay huge dividends for people. For example, the conservation of natural open space within the urban-rural matrix provides not only a sense of place and of beauty but also a wide variety of critical ecosystem services. Ecosystem services are the resources and processes, such as clean air and water, supplied by natural ecosystems, and these services are useful to humankind. These services, available free of charge, are highly valued economically, and yet they are rarely bought, sold, or factored into the cost of consumer goods and services. Once humans damage the ability of natural areas to provide these services, high costs to society are realized. Scientists around the world have collaborated and produced a nice summary of the consequences of ecosystem change on human well-being. Ecosystem services are essentially the life support system for all species on earth, including humans. In a scientific paper published in the journal Nature, the global economic value of twelve major ecosystem services and five major ecosystem goods was estimated to be approximately $16-54 trillion (U.S. dollars), with an average of $33 trillion (U.S. dollars) annually. The paper additionally estimated the global gross national product to be $18 trillion (U.S. dollars) annually for the services natural ecosystems provide. The diversity of ecosystems, plants, insects, and animals benefits humans in a variety of ways. For instance, wetlands help purify and remove contaminants from freshwater. Coastal wetlands serve as nurseries for many of the fish and shellfish species that we eat on a daily basis. Most medicines are derived from plant, fungal, and animal sources, and new sources of medicines are sometimes needed to advance our fight against diseases. If a species goes extinct, we lose its genetic material and our ability to derive new medicines from it. Pollination by animals helps in the production of food. A variety of insects and animals pollinate such crops as nuts, fruits, and vegetables, but agriculture currently relies on one or two pollinating insects. Pollination is much more robust if there are many different species providing this service. In the United States, growers rely on European honey bees (Apis mellifera) for pollination of fruits, but the honey bee population is currently being decimated because of a number of factors, including parasitic mites and pesticides. To pollinate citrus groves, farmers have relied on honey bee specialists who ship honey bee hives to each individual citrus grove. Because these managed hives are failing and honey prices have decreased, fewer people are shipping honey bee hives to local farmers. Farmers are scrambling to find adequate pollination services. Because the quantity and diversity of other insect pollinators have been reduced by the applications of pesticides and by habitat destruction, local insect populations are insufficient to take over pollination services. Growers are now attempting to alter their agriculture practices and bring about the return of native pollinators. Habitat loss, another aspect of biodiversity loss, also can affect ecosystem services. The replacement of coastal ecosystems with development can lead to increased damage caused by tidal surges. When homes are built right on the coast, no buffer in the form of estuaries or dune ecosystems exists to protect human development from tidal surges, and often the beaches have to be rebuilt to save homes, at an enormous economic cost to the public. The Atlantic and Gulf states have spent upward of $2.5 billion to replenish beaches. A highly diverse ecosystem is very good at producing the oxygen we breathe and at sequestering the carbon dioxide we produce in vast quantities through our consumption of fossil fuels. Many intricate connections exist among the organisms in an ecosystem, and the loss of a few or many species can disrupt this balance and ultimately lead to a disruption in the service an ecosystem provides to us. Even managing pests can sometimes disrupt and alter natural processes, often with unintended consequences. For example, many species of birds serve as checks on insect populations that feed on tree foliage in forests, which we rely on for wood products. Models have predicted that, in the boreal forest, as the use of pesticides increased, forest foliage would become so dense that the populations of pest insects, such as spruce budworm, could not be effectively controlled by birds. Pesticide use would be effective initially, but over time it would become ever more costly and ultimately ineffective because more and more pesticide would be required for the same effect. Eventually, huge insect outbreaks would occur and vast areas of forest would be affected. Thus, bird populations, along with judiciously applied pesticides, play an important role in controlling spruce budworms. If forest bird populations were to significantly decline, spruce budworm containment would become more and more difficult and economically infeasible. What about loss of biodiversity in terms of species diversity? Could not exotic species that have replaced natives provide the same ecosystem services? Many exotic species can effectively remove CO2, a greenhouse gas, from the atmosphere and sequester it. But homogenizing the species composition around the world may have many unfortunate consequences, such as limiting our genetic resources and ability to create new medicines and biochemicals. And ecosystems that are more biodiverse can sequester more CO2 than can ecosystems with species-poor assemblages, thus they help to decrease the likelihood of climate change. Also, many intricate connections exist between the physical environment and local, native organisms, as in the honey bee example mentioned earlier. Replacing the diverse array of natives with only a few exotics may have many unforeseen consequences, and doing so may be like placing all the eggs in one basket. Whenever the pressure of our complex city life thins my blood and numbs my brain, I seek relief in the trail; and when I hear the coyote wailing to the yellow dawn, my cares fall from me-I am happy. Natural areas help create a sense of place. Natural areas-forest areas, meadows, coral reefs, natural springs, rivers-contain a unique blend of plants, animals, and other organisms. Each location in the world has its own natural heritage, and people in all parts of the world are connected to the distinctive mix of plants, animals, geography, and climate in their area. Conservation and restoration of biodiversity in and around cities provide urban inhabitants with the opportunity to create a true sense of place. Valuable natural areas can be as small as an individual yard or a neighborhood pocket park. Creatively designed gardens and native landscaping can bring a bit of the natural environment right into urban surroundings, accommodating the needs of humans and wildlife. Natural areas within cities are often used to educate people about their environment and human history. A 2002 study found that when people are exposed to unstructured natural areas as children, they express more positive perceptions of natural environments and outdoor recreation activities later in life. A number of studies have demonstrated that urban residents around the world desire contact with nature in an urban setting and have strong aesthetic preferences for community designs that incorporate natural areas. Interaction with natural areas promotes better human health. There is a growing body of evidence that our own psychological and physical well-being is rooted in our connection to nature. Conversations about "biophilia" and "deep ecology" discuss the intricate link between nature and humans. Even though many people live in urban environments, and most of their lives are spent in cars, homes, and other buildings, their emotional well-being and health depends on their ability to experience nature. The ways in which urban communities are built and maintained have direct and indirect consequences for natural environments and human health. People recover from stress more quickly when exposed to natural vegetation instead of urban settings. It is especially important that children play outside. A 2003 Environment and Behavior article found that access to natural areas protects children from the impact of life stress. Stress levels were reduced as kids spent more time playing outside, and this protective buffering intensifies with increasing stress levels within children. Furthermore, the amount of time spent in contact with nature affects a variety of human health factors, such as the level of cognitive functioning, the number of physical ailments, and the speed of recovery from illness. Natural areas provide shared green space for humans to interact and recreate. By incorporating green space and walkability into their designs, residential communities create areas where people can interact and recreate. Natural areas in cities promote interactions among residents and recreation such as walking, playing, and watching wildlife in a more natural setting. One study found that a sense of place, attachment, and satisfaction were affected by not only social constructions but also the landscape attributes of the natural environment. Conventional designs for cities, without walkable neighborhoods or green space, are counterproductive to an individual's need to experience community, and urban residents really desire a sense of community. In a review of Landscape and Urban Planning journal studies that looked at how humans interact with outdoor urban environments, the article found that people highly value natural urban areas in which to interact and play. Natural areas provide opportunities to watch wildlife. In urban areas, many people observe and interact with wildlife. People value watching wildlife, and surveys indicate that a vast amount of wildlife watching occurs in and around the home. Of a reported 71.1 million wildlife watchers in the United States, about 67.8 million people have observed wildlife around their homes. Of these people who observe wildlife near their homes, 55.5 million reported feeding wildlife, 44.5 million observed wildlife, 18.8 million photographed wildlife, 14.5 million planted and maintained natural habitat, and 13.3 million people visited public parks to watch wildlife. Many public and private agencies have responded to this interest with programs about landscaping for wildlife and wildlife watching. The National Wildlife Federation (www.nwf.org), for example, has the Backyard Habitat Program, which provides tools and resources to help homeowners create wildlife habitat in their backyards, and several notable backyard bird surveys have been established online (e.g., Cornell Lab of Ornithology, www.birds.cornell.edu). Healthy natural areas allow for tourism and recreation. Ecotourism provides a substantial income for many states. In the United States, hunting, fishing, and wildlife viewing generate approximately $122 billion in revenue. Of this, about $45.7 billion was spent on wildlife-watching activities alone, including equipment and travel expenditures. And ecotourism is heavily influenced by the quality and quantity of developed areas. Unless sustainable development practices are implemented within a state, built areas ultimately affect the natural areas that tourists enjoy. In the United States, the tourism industry provides a substantial income for many state economies. Preserved natural areas can increase property values. Preserving natural habitats can decrease irrigation costs. Native plants are adapted to an area's annual cycling of wet and dry seasons. By reducing the amount of formal landscaping that incorporates exotics, and preserving natural areas, developments can reduce or eliminate the need for supplemental irrigation. Conserving open space can help to sell homes. A 2010 study indicates that both homeowners living in green communities, and those in conventional communities, want to have "green features" in their neighborhoods. The features they asked for included open space, places to watch wildlife, and walkability. Furthermore, homes in conservation subdivisions tend to sell more quickly and at higher premiums. Established land use conservation options can provide direct cash payments or a substantial reduction in property rates. Options such as conservation easements, land donations, and land sales can preserve natural areas in perpetuity while providing economic incentives to land owners. Land is "sold" to a local land trust (see the Land Trust Alliance Web site, www.lta.org), and landowners receive money for taking land out of the realm of development. More details about conservation easements are discussed in chapter 3. Some municipalities and organizations offer financial incentives to promote green building practices and natural resource conservation. Several municipalities offer quicker application reviews for developments that preserve natural areas or that are composed of energy-efficient homes. For example, the City of Gainesville, Florida, has a fast-track incentive and gives permit breaks to contractors who build energy-efficient homes. Also, Fannie Mae offers a variety of incentives to homebuyers purchasing green homes. 1. Environmental integrity: green communities conserve natural resources and minimize impacts. 2. Sense of community: people in green communities are connected with their neighbors. 3. Health: the homes, yards, and neighborhoods have a positive impact on our psychological and physical health. Some may quibble about the importance of these three principles, and each person may feel most strongly about one or two of these principles. Yet all of these components are interconnected in many direct and indirect ways. For instance, the conservation of urban natural areas can also mean the conservation of local biodiversity, as well as provide places for people to interact with each other and improve their psychological and physical health. In this book, I give ideas that directly address the issue of environmental integrity. Whenever I use the term green community or sustainable development, I am thinking about all three components as they are interrelated, but I explicitly concentrate on methodologies to conserve biodiversity. As mentioned previously, conserving biodiversity can promote a sense of community, a healthy environment, and even economic vitality. Around the world, a sustainable movement is under way, and a few green development initiatives have popped up (Table 2). Each green community project is different, and each varies in its degree of emphasis on biodiversity conservation. From my experience, most green communities emphasize energy-efficient housing and walkable communities, and place only a minor emphasis on biodiversity. In recent years, the term conservation subdivisions has been used in the landscape architecture, planning, and environmental community to get across the concept of satisfying habitat needs for both humans and wildlife. The concept of a conservation subdivision is to group houses together on smaller lots, with the remaining areas left as open space. Seen as an alternative to conventional designs, conservation subdivisions have been promoted as a benefit to wildlife and a way to enhance an area's rural character. The concept of conservation subdivision is popular in the planning and design fields, especially in new urbanist literature, and is regarded as a design methodology to create more natural communities. Clustering homes to conserve open space is a step in the right direction, but many other aspects of design and management must be considered if we are to create functional habitat that supports a diversity of species. Simply conserving a percentage of open space may not be enough to conserve biodiversity, because many other ecological, environmental, and management issues come into play. 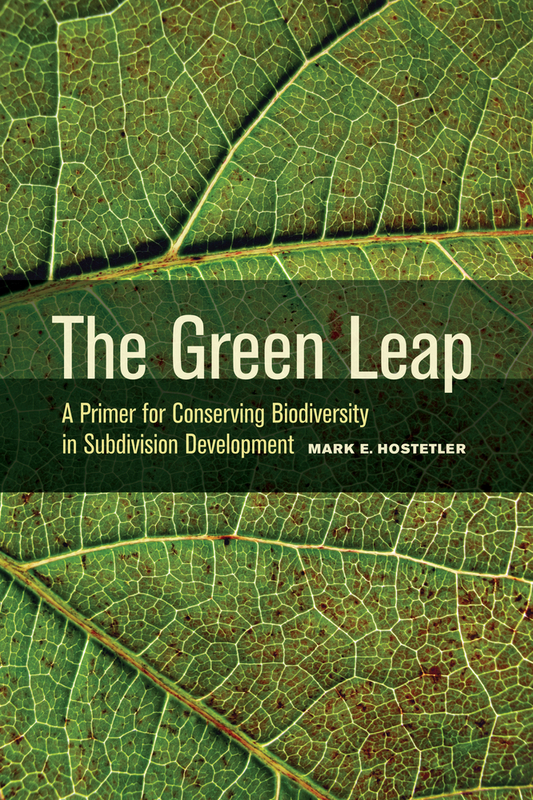 Written for anyone interested in green development—including policy makers, architects, developers, builders, and homeowners—this practical guide focuses on the central question of how to conserve biodiversity in neighborhoods and to minimize development impacts on surrounding habitats. The Green Leap specifically helps move green development beyond the design stage by thoroughly addressing construction and post-construction issues. 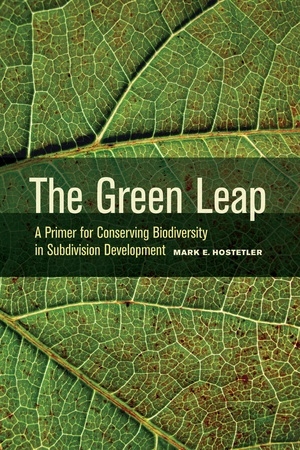 Incorporating many real-world examples, Mark Hostetler explains key conservation concepts and techniques, with specific advice for a wide variety of stakeholders that are interested in creating and maintaining green developments. He outlines the key players and principles needed to establish biodiverse communities and illustrates eight key design and management strategies. The Green Leap not only offers essential information for constructing new developments but also helps existing communities retrofit homes, yards, and neighborhoods to better serve both people and nature. Mark E. Hostetler is a Professor in the Department of Wildlife Ecology and Conservation at the University of Florida, Gainesville. 1. Why Build Biodiverse Communities?